There’s just three more weeks to go as we get to witness in all its glory the eighth and final season of HBO’s much-awaited series, Game of Thrones. While we all await for the ultimate fate of Jon Snow, Arya Stark, Daenerys Targaryen, and the rest of the Westerosi, Johnnie Walker gives us a taste this summer of what’s to come in the mysterious realm of White Walkers with their limited edition White Walker whisky, indicating that Winter Is Finally Here. Just last March 28, Johnnie Walker Philippines unveiled their biggest GOT-inspired pop-up party to date, in WhiteSpace Manila, to bring their guests into an immersive journey to the frozen North. Guests were toured into the Four Flavor Houses, which represent the many flavors of Johnnie Walker. In each flavor zone is a celebrity endorser who will represent what the room and drink is all about. The first flavor zone is the domain of spice and fire, or the Red Label House represented by DJ Patty Tiu. The Red Label whisky has a bold, characterful flavor, joined by the aromatic spices of pepper and cinnamon, that shines through even when mixed. This drink can keep anyone warm even in cold winter nights. The second domain or flavor zone is the dark and dramatic forest or the House of Black Label, which is represented by model and cosplayer, Alodia Gosiengfiao. This domain embodies the spirit of Black Label being tested by fire. The Black Label whisky is known for its deep, smoky, and smooth blends arising from the perfect combination of vanilla and dark fruits, blended together to stand the test of time. The third flavor domain is the realm of Johnnie Walker Gold Label represented by DJ and host, Sam YG. This flavor zone delights in and celebrates beautiful harvests, opulence, and luxury. The Gold Label whisky has a lavish spread of flavors – the delicate sweetness of honey and nectar, the distinctive flavor of salted caramel, the intoxicating aroma of vanilla, and the velvety goodness of buttered corn. It was well represented in a room full of curtains & candelabras in gold, a table spread full of the harvest, and a golden photo booth full of lights. The next domain or flavor zone is the kingdom of Johnnie Walker Blue Label represented by eventologist, Tim Yap. In this room is a blue and golden throne surrounded by stained glass windows and huge golden candelabras. The Blue Label whisky is an exquisite blend made from some of Scotland’s rarest and most exceptional whiskies, created for the appreciation and enjoyment of those with the most discerning palates. The event’s climax happens when the White Walker breaks the ice wall that is presented to the audience through a huge projection. 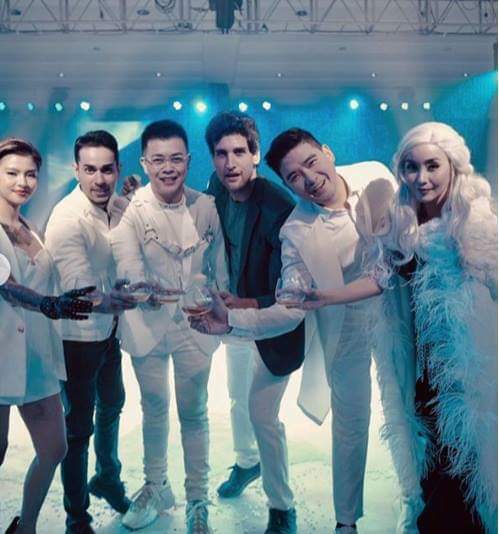 The brand ambassadors, Tim Yap, Sam YG, Patty Tiu, Alodia Gosiengfiao, as well as model Nico Bolzico and stylist, Myrrh Lao To, welcome the guests to the White Walker Zone, where the Johnnie Walker White Walker whisky is finally introduced. This particular whisky is smooth, with hints of vanilla and caramelized sugar, fresh red berries, and single malts from Cardhu and Clymelish.Of course the night is incomplete if the audience wouldn’t take a lesson or two from Tyrion Lannister who drinks and knows things! The guests had a drink or two as they were served with glasses of whisky cocktails such as the Night King’s Sour White Walker Cocktail, Black White Fire, and Winter Highball, while enjoying the house music played by no less than DJ Patty Tiu.Avail the limited edition Johnnie Walker White Walker Whisky before the wights freeze the stocks. Check it out in S&R, SM Supermarkets, and other major supermarkets nationwide.